Subscribe to our newsletter to get access to this pdf. Collate all of your contacts seamlessly with Unity’s new integration with Salesforce.com and Agile CRM. Facilitate contact lookup, automatically pop the CRM contact page and add call log entries and notes to contacts which are then saved in your CRM system. Transform the way you connect by integrating your CRM platform with Unity, simply configure your CRM settings as soon as a CRM integration license has been assigned. Contact Search – When you perform a contact search, not only will Unity check all directories such as the group/enterprise phone list, personal directory and Outlook etc, but it will also dynamically search your CRM contacts. Automatic Contact Pop – Right-click a call to pop the record in your CRM platform using the default browser. 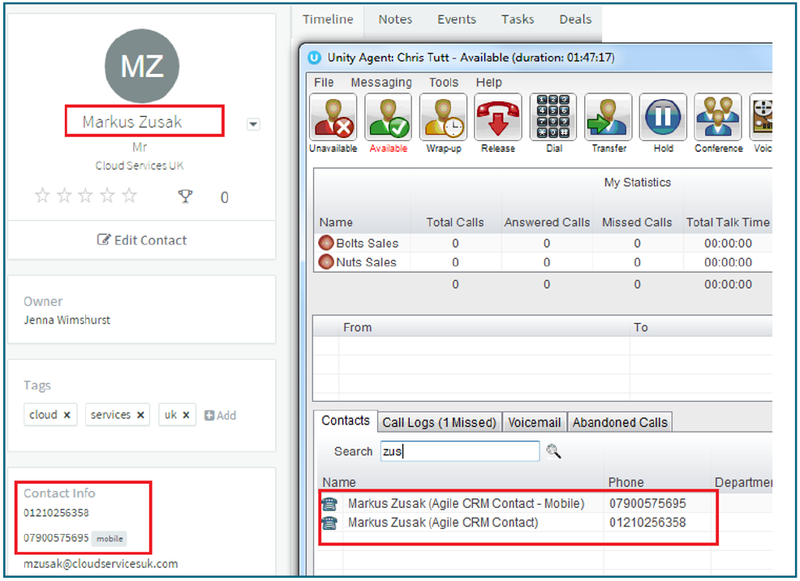 Unity can also be configured to automatically pop the CRM contact when the call is answered. Salesforce Call Log Automation– Automatically add a call log entry for any calls within Unity. Users can then add further notes, manually which will then be stored in your CRM platform. Copyright © 2019 DRD Communications Ltd. All rights reserved.